The New York Yankees are officially banged up. Prior to Saturday’s game against the Orioles, the Yankees placed both starting pitcher C.C. Sabathia and infielder Brandon Drury on the DL. Those two join the likes of Greg Bird, Clint Frazier, Jacoby Ellsbury, Aaron Hicks, and Billy McKinney on the injured list. The Bronx Bombers have called up pitchers Luis Cessa and Domingo German, as well as utility man Jace Peterson to fill the void on the active roster. Sabathia started Friday’s loss to the Orioles. He was removed after four innings of what would become a 14-inning game because of pain in his hip. Sabathia underwent an MRI that came back clean. However, the Yankees are choosing to be cautious with the 37-year old lefty by putting him on the DL. But the Yankees want to make sure he has the time to fully heal from whatever is ailing him. Drury also made an early exit during Friday’s game, complaining of migraines and blurred vision. He is set to undergo tests on Monday, so his status is unclear for the time being. Yankees manager Aaron Boone said the term is “very concerned” about Drury, especially since the cause of his blurry vision is unknown at this time. With Drury going down, the Yankees have a natural replacement in Miguel Andujar. The 23-year old prospect came up last Sunday amidst the team’s other injuries. He made a strong impression during spring training, hitting four home runs and posting an OPS of .928. Some supported Andujar being the team’s regular third baseman this season. But the Yankees decided to give him more seasoning in the minors, which is part of the reason the club acquired Drury. However, with Drury sidelined indefinitely, Andujar figures to get most of the playing time at the hot corner. Peterson and Tyler Wade could also see time there. 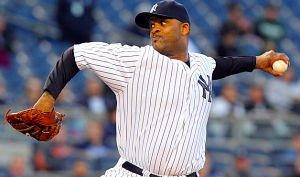 As for Sabathia, he will miss at least one or two starts while on the DL. The Yankees can reshuffle their rotation and because of an off day on Monday, they won’t need a replacement for Sabathia until next Saturday. At that point, the Yankees may need to call up a starter from the minors to join their rotation. Prospect Chance Adams is one option, although he struggled in his first start of the season in triple-A. Fortunately for the Yankees, depth was one of their strengths heading into the 2018 season. However, the volume of injuries has started to pile up in quick succession. As it stands, the Bronx Bombers are just 4-4 on the season heading into Saturday’s game against the Orioles. At this point, they may need to keep treading water until they can get healthy.